As the state emerges from the most recent recession and continues to experience economic growth, it behooves individual communities to take stock of their own economic situation and follow a path to set their economic future. One of the most effective methods of a community taking charge if its economic future is by implementing a grass-roots based economic and community development based strategic planning process that utilizes objective baseline socio-economic data to provide the community’s leaders (both elected and non-elected) with a firm foundation from which to analyze internal and external factors that affect a community’s future. The economic development faculty within the Department of Agricultural Economic has significant experience in deriving and assembling the types of data needed to provide a clear picture to your community leaders. For further information and assistance, please contact Alan Barefield (662.325.7995; alanb@ext.msstate.edu), James Barnes (662.325.1796; barnes@agecon.msstate.edu) or Becky Smith (662.325.1793; becky.smith@msstate.edu). Dr. Darrin Webb, Mississippi State Economist and MSU Agricultural Economics alumnus, presented the 2014 Legislative Economic Briefing on January 14. This briefing provided some welcome highlights to the economic situation for the state. In short, the Mississippi economy is growing, but mainly in terms of jobs (income growth continues to be relatively slow). The Index of Coincident Indicators has risen fairly steadily since January 2012 and the November 2013 index was slightly above its pre-recession levels. However, employment growth has been relatively strong with a 1.71% increase from 2012-2013 (the U.S. growth in the same time frame was 1.6%) and 53 of the state’s 82 counties experienced some job growth. Overall, Mississippi gained almost 19,000 jobs with the largest growth sectors being professional services, construction, and leisure and hospitality. The manufacturing work week length experienced an increase in mid-2011 and has remained higher than pre-recession levels. However, income growth has not fared as well. While year-over-year percentage growth in real personal income less transfer payments has remained positive since the 4th quarter of 2011, this growth is experiencing declines. Likewise, the growth in real state income tax withholdings has fallen and Mississippi ranks 44th in the growth of wage and salary disbursements. The University Research Center projects that real output for the state will continue to grow through 201, but at slower rates than were seen in the early 1990s. Much of the recent growth has been due to low-wage and temporary jobs, but it is anticipated that Mississippi should improve as the national economy improves and that the state is on track to reach the revised 2014 estimates. Dr. Webb’s complete presentation can be viewed at http://www.mississippi.edu/urc/downloads/presentations/Legislative%20Economic%20Briefing%20-%20Online%20Copy.pdf. One more weekend to take advantage of the 2013 Fall Agritourism Season! Join the fun! Find local agritourism operations registered with the Mississippi Agritourism Association by clicking on the pumpkins here http://mississippiagritourism.org/member_map.htm or using the list format. Search your county for operations using the Mississippi Development Authority website: http://www.visitmississippi.org/agritourism.aspx. Agritourism is the fastest growing sector in the tourism industry and is making a positive impact on rural economies in Mississippi. Demand for agritourism arises from urbanites looking for ways to experience the outdoors and learn about farming and the food supply. Agritourism is a popular way for families to connect to history and place and spend quality time together away from electronic devices. Supply of agritourism arises from agricultural producers adapting to changing economic realities. Many find that devoting a small portion of acreage to agritourism efforts is a relatively profitable way to use their land. In 2007 the US had 23,350 farms offering agritourism and outdoor activities which provided $566 million in annual revenues for farms. Between the 2002 and 2007 Census of Agriculture, income from agritourism increased 128 percent in Mississippi. In 2007, the average income per farm from agritourism was $16,000. It is estimated that current trends will increase, and, if so, the average agritourism income per farm in Mississippi will rise to $43,000 in 2013. The agritourism industry in Mississippi has a handful of large operations which boast between 30,000 and 90,000 visitors each year. However, most of the operations are much smaller and are in the start-up phase. A two-year Limited Liability Law (LLL) passed in the Mississippi Legislature in 2012 and is expected to be codified in 2014. Many operations are expected to open due to passage of LLL which protects operators from any liability, provided there was no negligence on the part of the owner. In order to be covered, operators MUST be registered yearly: http://www.mdac.state.ms.us/programs/agritourism/index.html. Contact Becky Smith (becky.smith@msstate.edu) for more information. Most of us understand that the term “Gross Domestic Product” refers to the monetary value of value added output of the United States. But we may not realize that this same concept can be applied to states and counties as indicators of economic growth. 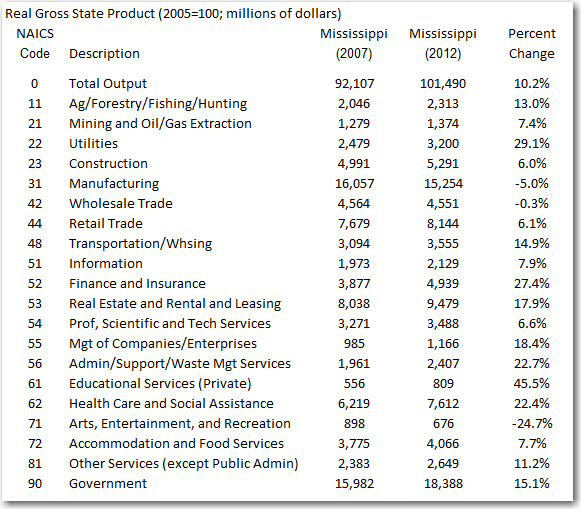 From 2007 to 2012, gross product for Mississippi increased by almost $300 million (33.4%) in real terms (see the following table). And the changes for individual counties were just as varied. 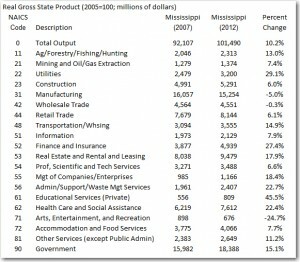 From a high of 131.6% change for Kemper County (primarily due to the utilities and construction sectors) to a decline of 53.6% for Tunica County (declines in the arts, entertainment and recreation sector overrode several sector expansions), Mississippi’s counties have experienced a large number of economic expansions and declines. On a state-wide basis, the largest gains (in percentage terms) have come from private educational services (32.5%) and utilities (17.5%) while the largest declines have been in manufacturing (-16.2%) and arts, entertainment and recreation (-31.5%). And while the largest expansions and contractions have been concentrated in the state’s most populous counties, many of Mississippi’s small counties have experienced large absolute impacts as well. For further information, a set of county economic and retail profiles for Mississippi can be found at http://muscares.com/crd/county_profiles/. Step 1: Go to Insights for your page. Step 3: Click on “When Your Fans are Online” – this IS the view you want. This view shows you two things: (1) The average number of your fans who saw any posts on Facebook by day of the week; and (2) The average number of your fans who saw any posts on Facebook in an hour. The figure below shows an example from the Mississippi State University Extension Program that I deliver to communities here in Mississippi called Mississippi Bricks to Clicks. You will see two “Insights” from the view I have described above. First, you see that Wednesday (this past week) was the highest number of fans reached (116) and that the two top times were 3 p.m. and 9 p.m. View the info graphic about this, here. So, use what Facebook gives you now. Next week, I’ll use this information when making my own posts on the Mississippi Bricks to Clicks page. Give it a try. And if you don’t understand, feel free to contact me at barnes@agecon.msstate.edu.